The Mpemba Effect is a counter-intuitive phenomenon whereby, under certain circumstances, warm water can freeze faster than cold water. Although this phenomenon was known for a long time by many philosophers and scientist, including Aristotle, Rene’ Descartes and Francis Bacon, it was brought to the attention of the scientific community by a Tanzanian schoolboy, Erasto Mpemba. In 1963, during a school project, he noticed that an ice-cream mixture, previously heated, froze more rapidly than one that was cold. He was so intrigued by this phenomenon that he continued experiments until, a few years later, he went on to work with a physics professor, Denis Osborne, and together they published a paper in the journal Physics Education in 1969. A public competition announced by the Royal Society of Chemistry in 2012 to explain the Mpemba effect renewed the interest in this phenomenon. The above video provides a very clear overview of the various explanations that have been put forward. These include evaporation (the evaporation rate of warm water is higher and, consequently, there is a smaller amount of water to cool down), dissolved gases (the warm water contains less dissolved gas, which, apparently, hinders the ability of water to conduct heat), supercooling (the warm water contains more nucleation sites which makes it unlikely the need to get temperatures less than zero degrees Celsius for freezing), convection (the convection currents in the warm water are stronger and increase heat dissipation). None of these explanations is entirely convincing. A recent study has even concluded that the Mpemba effect is just an experimental artifact due to measurements’ inaccuracies. On the other hand, another recent study has shown, by theory and simulation, that the Mpemba effect and its reverse (a cooler sample may heat faster than a hotter sample) may occur in uniform granular fluids composed of inelastic particles and an explaination can be given based on the kurtosis of particle velocity distribution function. 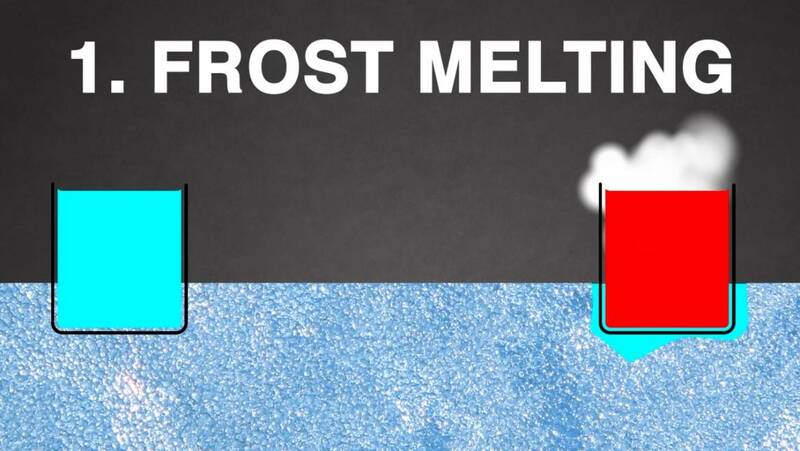 It’s surprising that something as apparently simple as the freezing of water is by contrast still poorly understood.